ABC Fact Check determines the accuracy of claims by politicians, public figures, advocacy groups and institutions engaged in the public debate. They do not check the work of journalists, from the ABC or elsewhere. All verdicts fall into three colour-based categories: In The Red, In The Green or In Between – red being a negative ruling, and green being a positive. The following Fact Check’s are in relation to climate change issues. 9 May 2016, Climate Institute: Prime Minister Malcolm Turnbull on the Paris Agreement during his press conference with Luke Howarth. No, they did not. In Paris, countries agreed to limit warming to 1.5-2°C and to achieve net zero emissions. A framework was also established to ratchet up national targets through time towards these goals. Before Paris, countries put forward a range of initial targets for 2025 or 2030. Counties only formalise their targets when they ratify the agreement. The Abbott government submitted its initial, and inadequate 2030 target, well after most other advanced economies. A process to update these targets starts in 2018. Updated 2030 targets are to be submitted in 2019-20. These targets will be judged against their compatibility with the objectives of the Paris Agreement – limiting warming to 1.5-2°C. Countries do not negotiate their targets. They are nationally determined. This is a key reason why the Paris meeting succeeded. History shows that when countries advance credible targets it drags up the targets of other nations, not the opposite. Australia is actually limiting its leverage by advancing an inadequate 2030 target. This is demonstrated by not being invited to a “High Ambition Coalition” meeting with the US, EU, small island states and other vulnerable nations on how we should accelerate towards the 1.5-2°C goal. 25 May 2016, The Conversation. Election FactCheck: is Australia among the only major advanced economies where pollution levels are going up? Australia is now pretty much the only major advanced economy where pollution levels are going up, not coming down. – Labor shadow minister for the environment, climate change and water, Mark Butler, speech to the National Press Club, May 18, 2016. During a debate with environment minister Greg Hunt, Labor’s shadow environment minister Mark Butler said that Australia is “pretty much” the only major advanced economy where pollution levels are rising. Is he right? Checking the sources: When asked for data to support his assertion, a spokesperson for Butler referred The Conversation to the United Nations Framework Convention on Climate Change (UNFCCC), the UN agency that oversees international climate negotiations. The spokesperson also referred us to the website of the Intergovernmental Panel on Climate Change, which suggests that by pollution he meant “greenhouse gas emissions”. However, the spokesperson did not specify what data set the statement was based upon, nor what Butler defined as a “major advanced economy”. The IMF defines a “major advanced economy” as the G7 nations (and Australia is not among its members). In this FactCheck, we aim to compare Australia’s emissions with a range of advanced economies including the G7 member countries, the EU bloc and a selection of others such as Iceland, Korea and New Zealand. The Conversation also asked over what time period pollution levels were “going up” according to Butler, but didn’t hear back before deadline. Nevertheless, there are some obvious data sets against which Butler’s statement can be tested. National Greenhouse Gas Inventory (excluding Land Use, Land Use Change and Forestry), annual, ‘unadjusted’ emissions, 2005 to 2015. Department of Environment. 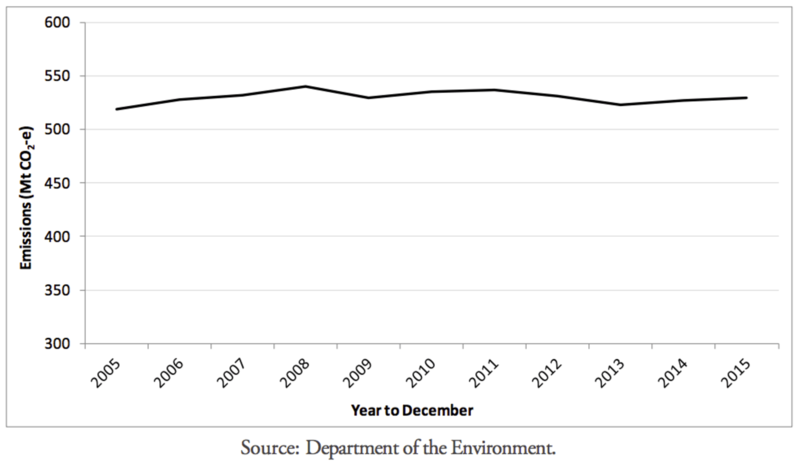 The graph shows that Australian emissions have essentially stagnated over the past decade. The data shows a slight decrease from 2012 to 2014 and then an increase from 2014 to 2015. So Butler was right to suggest that Australia’s emissions are on the rise, based on the latest 12-month snapshot. But is Australia the only advanced economy where that’s happening? How are other countries’ emissions trending? 18 May 2016, Renew Economy, Graph of the Day: Tony and Malcolm’s solar report card. As the two main parties prepared to enter a debate about climate change and clean energy policies, the Australian Solar Council, the industry’s principal lobby group, released a report card on the Coalition’s efforts on renewable energy to date. The Coalition did not fare well, receiving an F in all subjects, apart from the Clean Energy Finance Corporation, where it got a D after deciding to keep the institution it had spent three years trying to dismantle, but allocated $1 billion of its funds elsewhere. 19 July 2016, In light of the time taken to form government and appoint the Hon Josh Frydenberg MP as the Minister for the Environment and Energy following the Federal election, the Climate Change Authority has decided with regret that there is no longer time for meaningful consultation on its paper on policies that could be used to reduce emissions in the electricity generation sector, and for the outcomes of that consultation to inform its work for the third report of the Special Review. The Authority has therefore decided that it will release the electricity paper and the third report of the Special Review together, by the end of August 2016. The Authority has made good progress on the Special Review in the election period. The Authority has drawn on submissions on the second report of the Special Review (which was released in November 2015 for consultation) in developing its thinking on policies that could be put in place for the electricity generation sector as well as the broader economy. The Authority thanks the many individuals and organisations that made submissions on emissions reduction policy during the Special Review. The third report of the Special Review will cover the policies the Authority recommends that Australia should implement to meet the outcomes of the Paris Climate Change Agreement. The Authority is very disappointed that a draft of its paper on modelling of policies that could be used to reduce emissions from the electricity generation sector has been leaked to the media. The Authority took an independent decision not to release the electricity paper, which is not finalised. The modelling examines seven policies for the period after 2020 but did not examine current climate change policies (the Emissions Reduction Fund and the safeguard mechanism). Because the report was not finalised, it has not been passed to the Government. The Authority will finalise the report after the election for consultation. The outcome of consultations on the electricity paper will inform the Authority’s special review into emissions reduction policies. The final report of the special review will also be released after the election. The Climate Change Authority Act 2011 requires the Authority to review particular climate change policies and initiatives and report to the Minister responsible for climate change and the Australian Parliament. The Minister for the Environment has asked the Climate Change Authority to conduct a Special Review, into Australia’s policies and future targets for reducing greenhouse gas emissions in the context of its international commitments and the action of other countries. The final report of the special review is due by 30 June 2016. The Climate Change Authority is analysing the electricity sector as part of its Special Review. This analysis will include modelling of a range of illustrative policies for reducing electricity sector emissions. The Authority will evaluate the policies by comparing their performance across a range of quantitative and qualitative indicators of effectiveness, efficiency and equity. The Climate Change Authority has released two reviews of the Renewable Energy Target, in 2012 and 2014. The 2014 review focused on a small set of priority questions, including the 2020 Large-scale Renewable Energy Target, the role of the RET after 2020, assistance for solar photovoltaics (PV) under the Small-scale Renewable Energy Scheme and the basis of exemptions for emissions-intensive, trade-exposed industries. The Climate Change Authority released its statutory review of the Carbon Farming Initiative in December 2014. The Authority evaluated the performance of the CFI to date; considered the extent to which the design of Emissions Reduction Fund (which replaces the CFI) improves on the CFI; and discusses the contribution the ERF could make to Australia’s emissions reduction goals for 2020 and beyond. The Climate Change Authority released the final report of its Targets and Progress Review in February 2014. The Authority considered Australia’s greenhouse gas emissions reduction goals and its progress toward meeting them. The Authority adopted a budget approach and recommended a coordinated set of emissions reduction goals for the short, medium and long term. The Authority’s draft report considers the full range of climate policy options, including the various types of emissions trading, and how the Authority proposes to evaluate them. This is the second report in the Authority’s Special Review. The Authority has made some observations following the announcement of the government’s 2030 emissions reduction target. This report explains why the Climate Change Authority recommends an emissions reduction target of 30 per cent below 2000 levels by 2025. The report completes the first of three phases of the Special Review of Australia’s climate action. This guide explains how to compare country targets, and the pros and cons of different approaches. In making its recommendations on Australia’s emissions reduction targets, the Authority will consider how Australia compares to other countries.